The Force index with ADX Trading System is purely a trend trading strategy. It has no chance of repainting. You can trade on any time frame except the 1 Minute Time frame. So don’t trade on 1 minute chart. 1. In Indicator trading window 1, when the Blue trend dot goes below the candle. 2. Exponential Moving averages 50(white), 100(yellow), 200(red) are very close to each other and are in the upward direction. 3. The candle should also break the previous candle’s high and any other significant recent high. 4. In Indicator trading window 2, the MACD bar should go above the zero line and the red MACD histogram bar should also cut through the Yellow signal line. It will give the perfect entry and will also avoid the bad fills. 5. 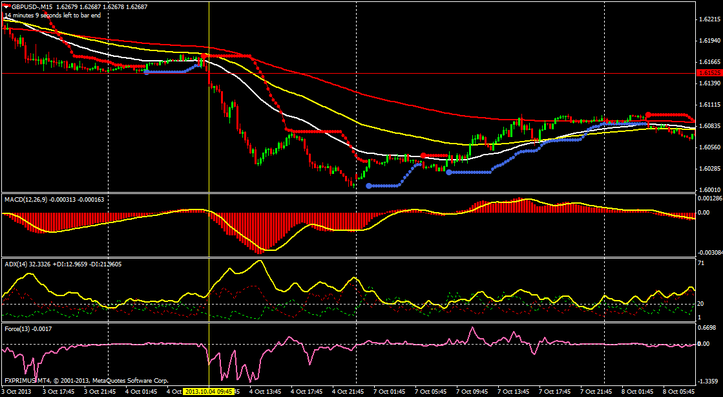 In Indicator window 3, The yellow ADX signal should preferably be rising up and above the white dotted 20 line. 6. In Indicator window 4, The Force Index Signal line in pink colour should be above the zero line. 7. In Indicator trading window 1, when the Blue trend dot goes above the candle. 8. Exponential Moving averages 50(white), 100(yellow), 200(red) are very close to each other and are in the downward direction. 9. The candle should also break the previous candle’s low and any other significant recent low. 10. In Indicator trading window 2, the MACD bar should go below the zero line and the red MACD histogram bar should also cut through the Yellow signal line. It will give the perfect entry and will also avoid the bad fills. 11. 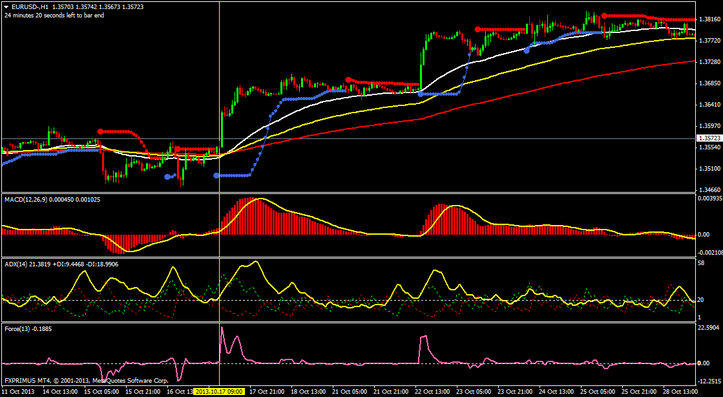 In Indicator window 3, The yellow ADX signal should preferably be rising up and above the white dotted 20 line. 12. In Indicator window 4, The Force Index Signal line in pink colour should be below the zero line. Exit the trade when the price cuts the EMA 100 by 5 pips atleast. The Force index with ADX Trading System.